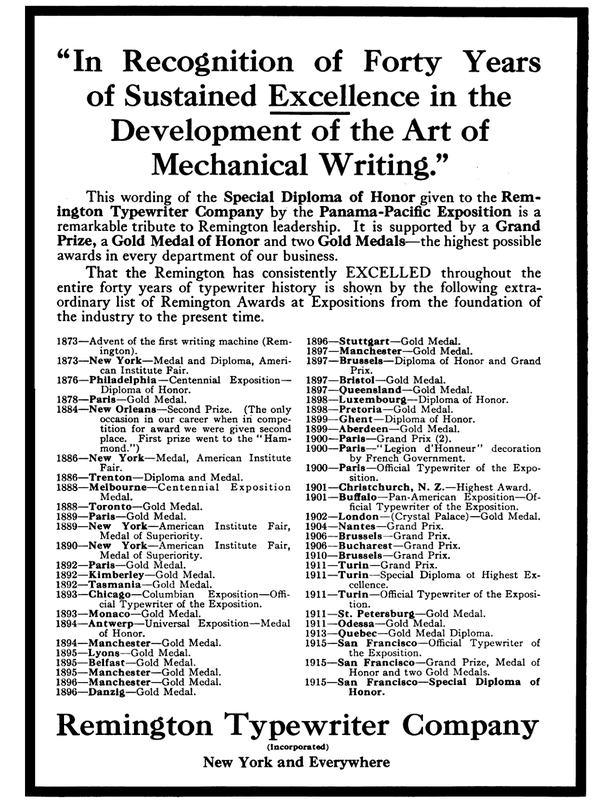 This list of awards won by the Remington Typewriter Company at expositions around the world between 1873 and 1915 was published as an advertisement in Typewriter Topics in January 1916. Note that Remington claims to have been beaten only once in such events, by Hammond in New Orleans in 1884. I was intrigued by a couple of prizes from Down Under. 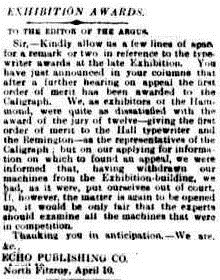 There is no record, at least none that I could find, of Remington winning an award at the Christchurch Jubilee Industrial Exhibition, which ran from November 1, 1900, to January 31, 1901 (although there was definitely a Remington typewriter bay there), nor from the International Exhibition in Christchurch in 1906. 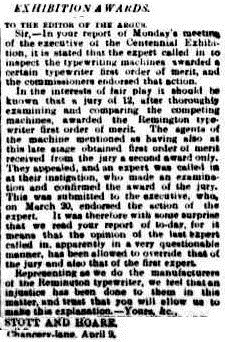 A Remington typewriter did, nonetheless, feature heavily in news reports from Christchurch in 1900-01, as it was at the centre of a sensational court case in which one Harry Vincent Styche was accused of trying to procure the murder of his wife. Extensive coverage of this case reached Australia and as far afield as the Osawatomie Graphic in Kansas. There is no question, however, about Remington's win at the Tasmanian International Exhibition in Launceston in 1891-92. The Remington was entered there by its Australian agents, Stott & Hoare. The three judges for the typewriter section at Launceston all had impressive credentials. The chairman was Jules François de Sales Joubert (above, 1824-1907), an adventurer and entrepreneur. Joubert was born on July 31, 1824, at Angoulême, Charente, France. From a school in Bordeaux he went to the College Bourbon, Paris. A founder of Hunter's Hill in Sydney in 1843, he was involved in either exhibits or the organisation of the 1876 Philadelphia Exhibition, the 1878 Paris Exhibition and the 1879 Sydney Exhibition. With Richard Twopeny he ran exhibitions in Perth in 1881 and Christchurch in 1882. In 1882-83 he organised the Calcutta Exhibition. He represented New South Wales at the 1888-89 Melbourne Exhibition and managed the exhibition in 1889-90 at Dunedin in New Zealand. He then went to Tasmania. where he organised the exhibitions at Launceston and one in Hobart in 1894-95. He died in Carlton, Melbourne, on August 24, 1907. Thomas Stanley Cleminshaw was born in Birch in Rusholme, St James, Lancashire, on March 10, 1851, and served apprenticeships at the London Steam Crane and Engine Works, Leicester, and at the Gorton Works of Beyer, Peacock and Co. From 1873 to 1875 he was engaged at the South Metropolitan Gasworks, Old Kent Road, and in 1876 he went to New Zealand as manager of the Christchurch Gasworks. He held that post for five years, during which time he also acted as engineer to the Ashburton Gas Company. In 1882 he was in charge of the reconstruction and extension of the works of the Greymouth Gas Company, and in 1883 he was appointed engineer to the Launceston Gas Company. In 1898 year he was appointed manager to the Colombo Gas and Water Company, Sri Lanka. It was there that he died of fever on March 18, 1899. William Paxman was born in Colchester, Essex, England, in 1866, and begun his working life as a machine maker and mechanical engineer. By the age of 21 he was managing engineer in the Colchester foundry of Catchpool and Catchpool. In 1865 he left to found Davey, Paxman & Davey. He gained considerable experience in using steam to power engines and carriages and went on to develop efficient and successful steam engines. 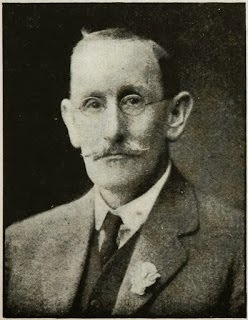 He was on the London committee for the Tasmanian Exhibition and exhibited several steam engines. He was also a member of the general committee of the exhibition. He died in Folkestone, Kent, on December 11, 1939. I can't imagine a Remington loosing to a Hammond. A poisoning conviction by a typewriter is quite unique.